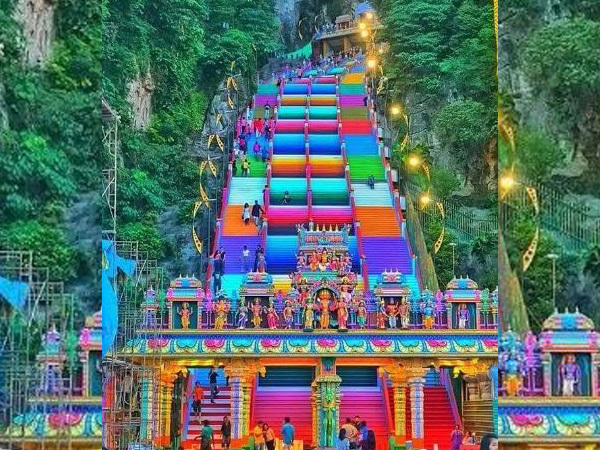 The new rainbow-coloured staircase of the Batu Caves in Malaysia has taken social media by storm but, it may land the temple committee in a legal soup. The 272-step staircase leading to the entrance of the Sri Subramaniar Swamy Temple has recently been painted with a myriad of colours like red, blue, yellow, green and orange. However, the renovation work was done without an approval from National Heritage Department (JWN), which is considering to issue a warning letter to the temple committee for violating regulations of the National Heritage Act 2005. The temple is listed under the National Heritage Registry as a National Heritage site. Though the colourful staircase has not been sanctioned by the National Heritage Department, people on social media have approved the new look. Recently transformed #batucaves ahead of Maha Kumbabhisegam on August 31st, 2018. Rainbow colors being painted on the stairs which lead to the temple by more than 100 volunteers to make it more colorful. Doesn't #BatuCaves stairs give you that cheerful, energetic, positive vibes ? Instead of bashing about it, take a moment to stop and stare! SO WHAT IF IT'S A DEVOTIONAL PLACE? Y'all go to pray also wear goddy kan? Atleast wanna look presentable right? It's the same damn thing! The staircase was painted few days ago for the Kumbhabhishekham (consecration) ritual, to be held today. The consecration is performed for every temple once in 12 years according to Hindu rituals.